Mengling will find any excuse to bake...even a dog's birthday. In butter tarts, raisins or no raisins? "No raisins, because I just don't think it tastes right. It's wrong." Mengling is "obsessed" with baking. She spends most of her downtime baking, reading about baking or looking at other people's baking on social media. Before birthdays and other big social events, she'll often take a "bake-cation" — taking the day off work to stay home and bake. She even baked a cake for her dog's birthday. Her Instagram is filled with beautiful bakes and inspirational images. Mengling taught herself to bake by watching internet tutorials. Even though she only started baking four years ago, she already has a long list of achievements: she made her own wedding cake (which was actually five different cakes in one), she made cinnamon-walnut-challah for a family friend's Shabbat dinner, and she hosts an annual Pi Day celebration that lets her flex her pie muscles. 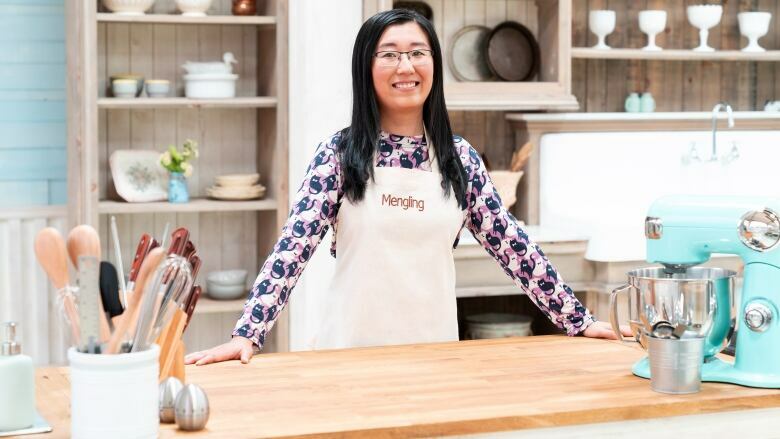 Mengling says baking gives her a chance to get creative. She loves to use unique ingredients, like ground tea, taro, hibiscus, and spinach. "Getting on the show will really push me to challenge myself. And I want to make friends with other baking-obsessed folks!"